We're taking the concept of jingle bells to the next level by adding a lot more jingle to your pocket. Expect to see way more coin this Christmas—and any time of year—in Santastic, a brilliant Christmas-themed game that you're going to love. Don't worry about putting up a tree and waiting for the presents to come to you. We're dropping you into the middle of Santa's workshop where the elves are hard at work making sure they've got enough presents for all the good boys and girls. And believe us, there are tons of presents to go around. This 3-reel, 5-payline slot machine features a top award of 2,500x your bet per line, a big jackpot, and a Festive Feast feature game where all kinds of prizes are waiting to be won. Want a piece of it? Download the fee Slots of Vegas software right now and get in on the Christmas spirit! It's easy to take control of the workshop and hang out with Santa and the elves. Just select your bet and payline numbers using the up and down arrows next to the Bet and Lines button. Then, click the Spin button to tell the reindeer that you want them to make a run for it. The reels will start spinning at record speed and faster than you can name the 12 reindeer, they'll come to a stop. If you land on the right combination of symbols, you'll get paid out according o the pay schedule. Any 3-of-a-kind win rockets you into the Festive Feature game where a special Bonus Meter will award you with a 2,500x your bet per line prize, one or three Jackpot Spins, or up to 25 free games. And it's not just the bonus round that leads to extra payouts. Landing on a Double or Triple symbol in a winning combination leads to 2x or 3x prize multipliers. And if you happen to hit both, we'll multiply your prize by three! 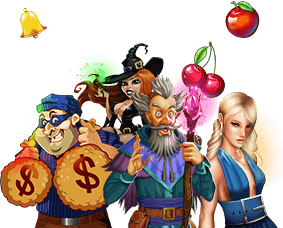 A lot of new slots players assume that winning at slots doesn't involve much of a strategy. Simply click a button and hope for the best is the common strategy most players take. But that's not necessarily the right approach. With Santastic, we recommend trying a betting strategy. Start by placing the minimum bet. When you win, increase your bet. If you lose, decrease it. You can also try the opposite (increase when you lose, decrease when you win). Not every strategy works all the time, but it's worth exploring if you want to build a bigger bankroll. Substitute Symbol: Santastic comes with two substitute symbols—Double and Triple. They can sub in for almost any other symbol in the slots game to help you complete a winning combination. The only symbol that doesn't apply is the JACKPOT symbol. AutoPlay: Want to see how fast the elves in Santa's workshop can move? Just turn AutoPlay on. Right after you've been paid out for a win, we'll use your last locked in bet and line selections to spin again for you. You can sit back in Santa's sleigh with your feet up while we do all the work.